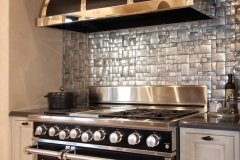 A Chef's Delight Newport Coast | Le Gourmet Kitchen Ltd. This stunning Newport Beach kitchen remodel transformed the open plan kitchen, while incorporating original structural features like the wooden beams and arched windows and doors. 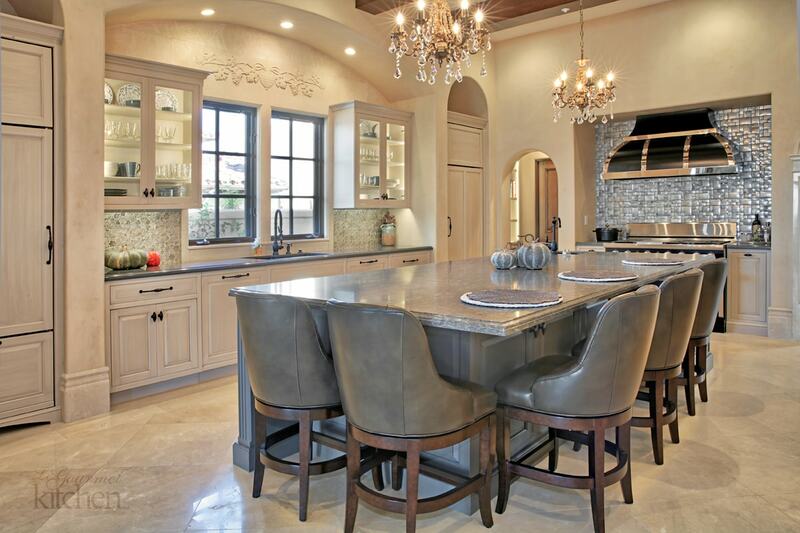 The result is a bright traditional style kitchen design that is sure to be the center of life in this home. The focal point of the new design is a Caliber 48” indoor professional range, which the clients wanted to stand out in the room. 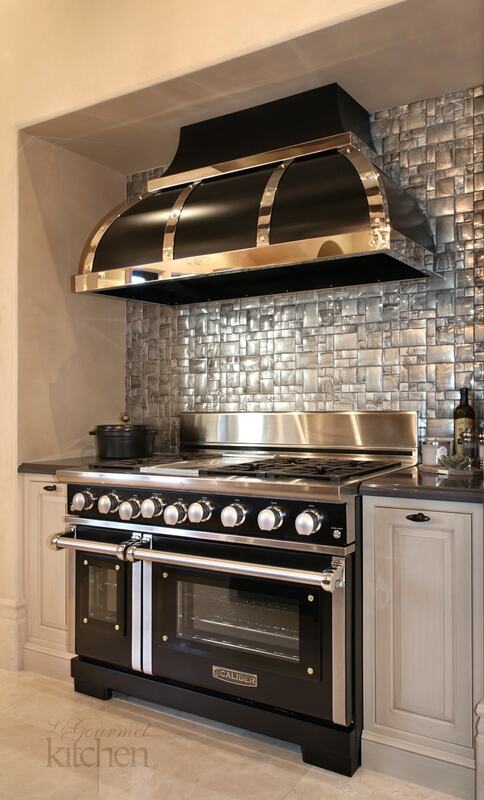 In a kitchen design by Bruce Colucci, this top of the line range is framed by a Le Gourmet Kitchen custom hood designed to complement the style of the range, as well as a sparkling metallic mosaic tile backsplash. The hood also incorporates a Vent-a-Hood blower system. The range, together with the Wolf combination steam oven, Wolf microwave, and Sub-Zero paneled refrigerator offer all the high-end appliances you need to whip up gourmet meals in the comfort of your own home. The Kountry Kraft Cabinetry raised panel kitchen cabinets maintain the traditional style of the kitchen, while brightening up the space in a light-colored finish. 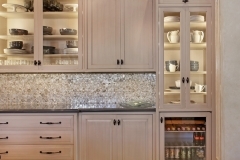 Upper glass front cabinets with in cabinet lighting offer room to display dishware and glasses and add depth and light to the room. The perimeter cabinetry is accented by a Caesarstone Coastal Gray countertop and mosaic tile backsplash, all highlighted by undercabinet lighting. A Blanco undermount kitchen sink is located along the perimeter, facing a window. A large island sits at the center of this kitchen design, and offers storage, work space, and ample seating in comfortable dining chairs. The gray island cabinetry is accented by a Pental Quartz Coastal Gray countertop and includes a second Blanco undermount sink, perfectly positioned near the range. This is ideal for filling heavy pots with water and for draining pots while cooking. Two sinks will also greatly help the clean up after preparing a meal, along with the Miele dishwashers. 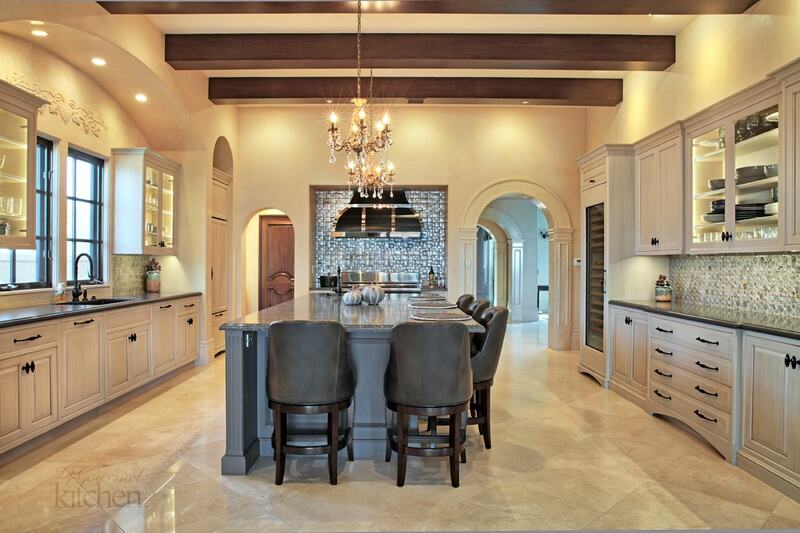 This amazing kitchen design also includes a beverage center with a Sub-Zero wine refrigerator and wine preservation. 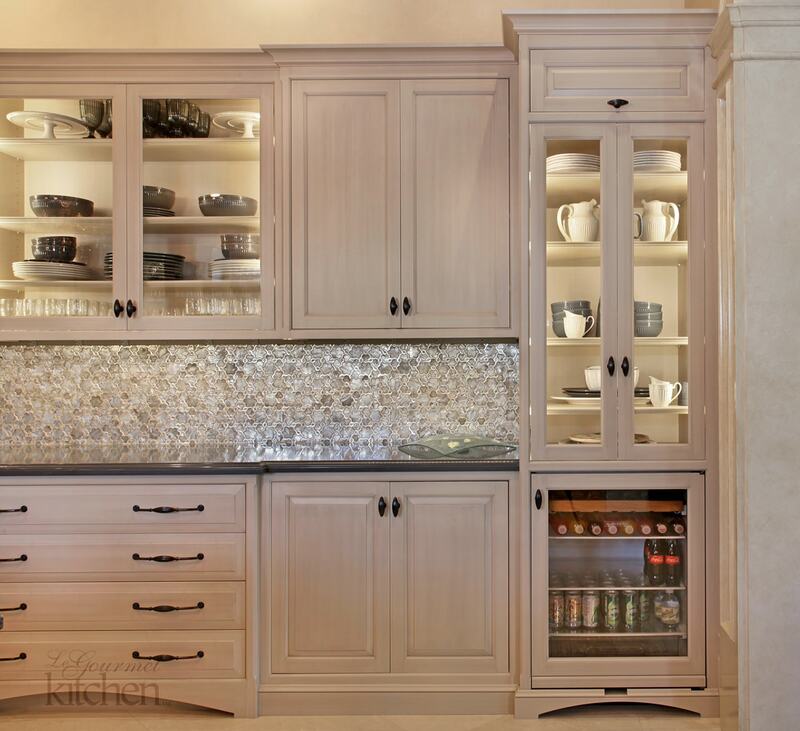 Glass front cabinets offer further display space in the beverage center. 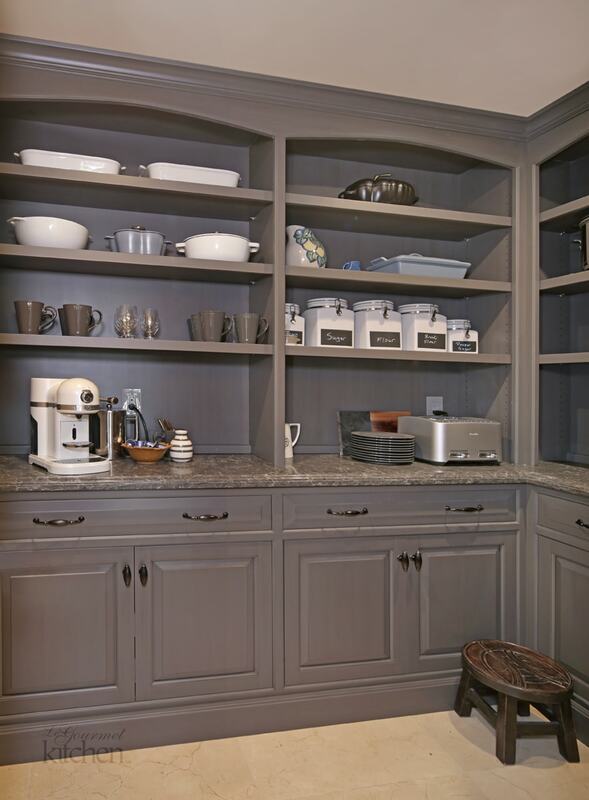 A large, walk-in pantry room is perfect for a busy kitchen. 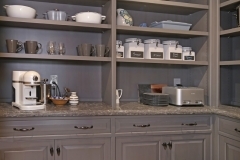 This pantry has gray cabinetry with both open shelving and closed storage, as well as plenty of counterspace for food preparation and small appliances. 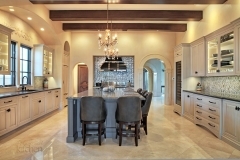 This Newport Coast kitchen design is the perfect place for family meals, parties, or a quiet glass of wine with friends. It is a home chef’s delight, with everything you need to be creative in the kitchen. It is sure to be the center of life in this home for years to come!